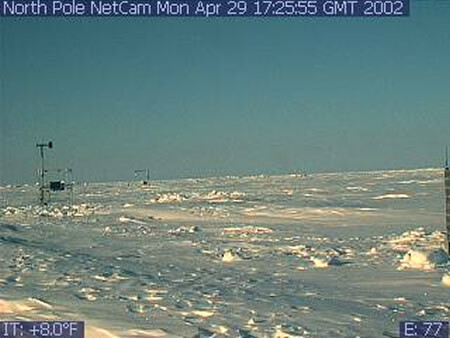 Sun is on the European side of the globe (shadows cast to the left) in this first image received from the North Pole web cam on 4/28/02 10:28 UTC. 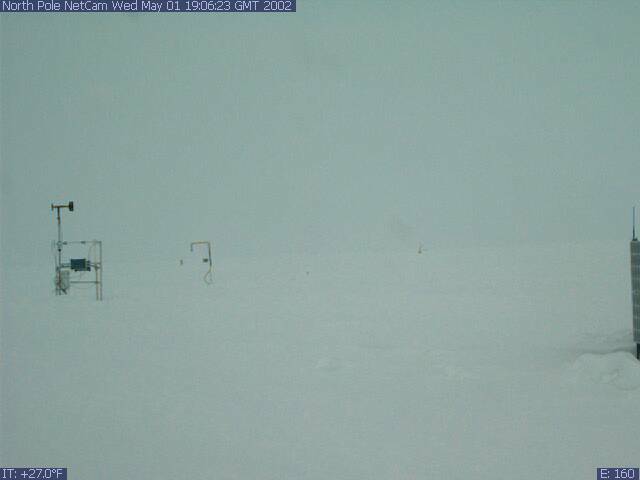 Snow conditions are typical for cold temperature of 6 F. In the foreground we see 40-50 cm of snow on top of the ice floe which is approximately 2.5 meters thick. From the anemometer, you can see the wind is blowing from Europe. Sun light is from the Pacific Ocean side of the globe (shadows cast to the right) in this image from 4/29/02, 17:25 UTC. 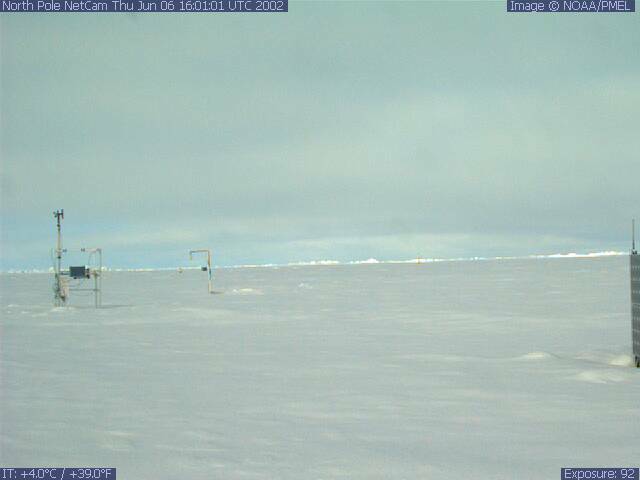 Jumbled ice on horizon is the pressure ridge at the edge of the floe. 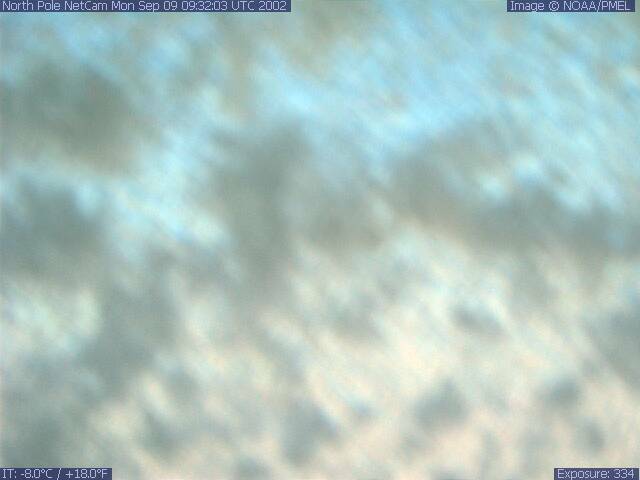 From looking at the anemometer, you can see the wind has shifted from the first image and is blowing towards Europe. "Sea smoke" The haze on the horizon is clouds, also called "sea smoke". "Sea smoke" is moisture which has evaporated from small regions of open water. 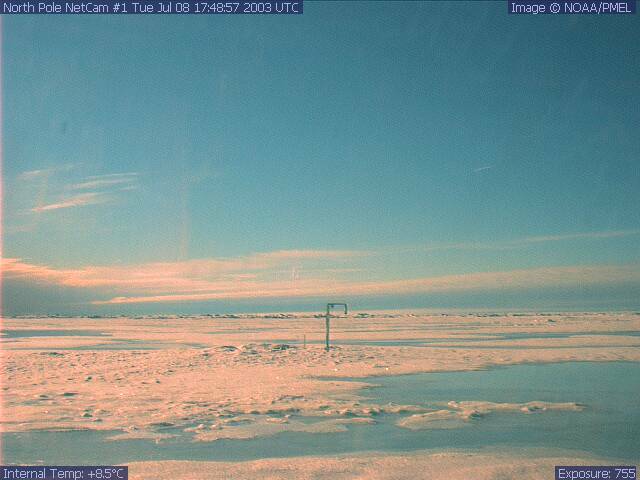 Sun is a little lower in the sky and the rosy colors are typical of twilight at the North Pole. The white spot in the left is the sun. 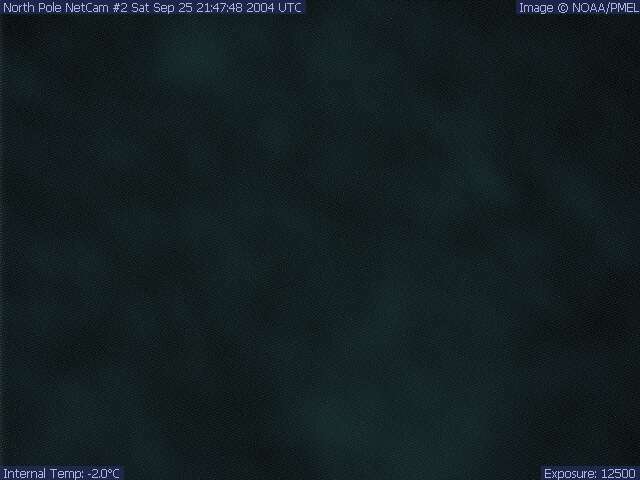 Image from 5/1/02, 00:24 UTC. 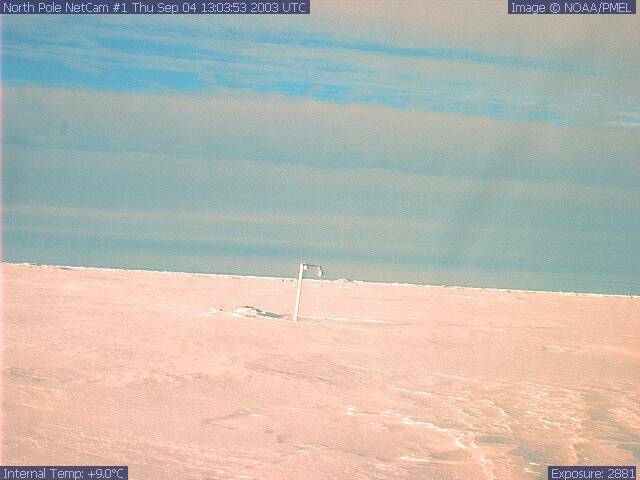 Spring conditions can be cloudy at the North Pole. Clouds are produced when the North Pole experiences Spring warming and the beginning of Summer melting. 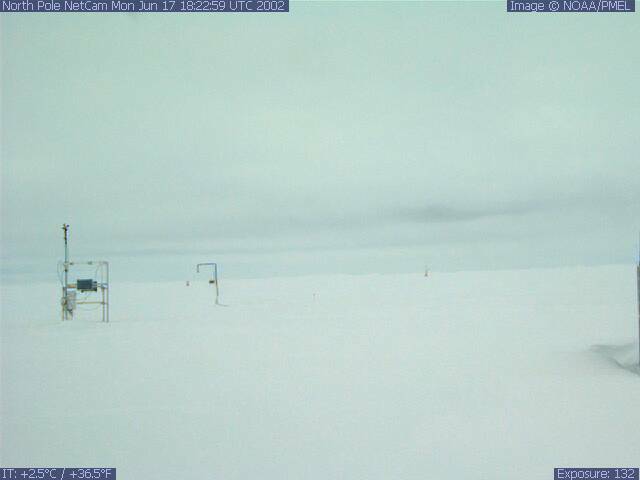 Water is evaporated from the melting snow surface, forming the fog and low clouds that are seen in Spring/Summer pictures from the North Pole, such as the one on the right from June 2002. In the left image, from 5/1/02 19:06 UTC, the surface is covered by fog and low clouds. Radiation energy is trapped near the surface and thus the temperatures have increased to a very warm 27 F.
Bright sunshine with warm temperatures of 15 F on 5/3/02 . Sun light from the Pacific Ocean side of the globe. 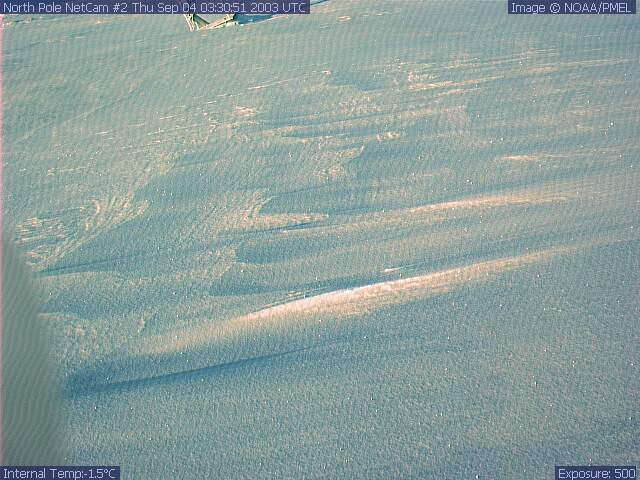 The variations of snow depth can be seen in the image. Spring melting can be seen by comparing the snow in the right photograph from 6/6/02 with the left image from 5/03/02, just a month earlier. What are the rose colors seen in some photographs? The pink lighting is due to the scattering out of other wavelengths of the sunlight by tiny ice particles in the atmosphere. These ice particles, also known as "diamond dust", are present in the Arctic even during clear skies, but are uncommon in the less pristine air at lower latitudes except during arctic-air outbreaks. The rose colors have been recorded by both Web Cams on occasion in 2003 and 2004 , but were not seen in any of the web cam photographs from 2002. 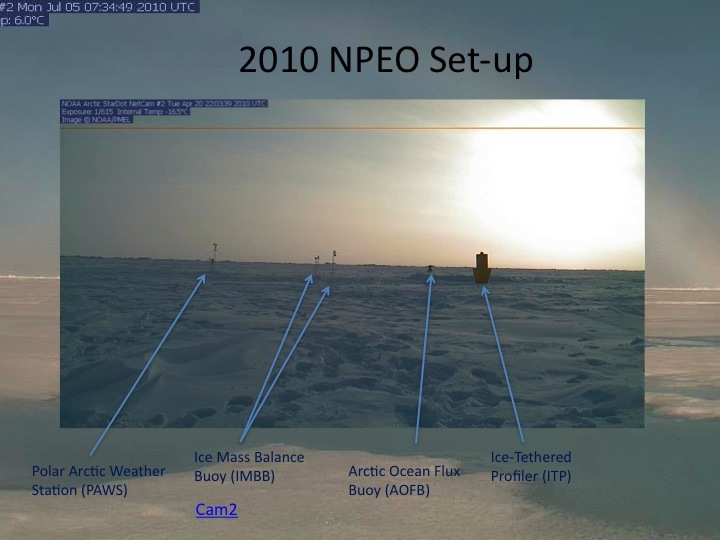 Years ago, only the early explorers saw the conditions we all see today with the North Pole web cam. Similar rose colors were recorded in artwork from the 1890's by Arctic scientist and explorer, Fridtjof Nansen. Here are links to some of Nansen's artworks: Kara Sea, Sunset off the North coast of Asia, Off the Edge of the Ice-Gathering Storm, The Waning Polar Day, 22nd september1893, Evening among the Drift-ice, 22ns september 1893, At Sunset, 22nd september1893. The Nansen pictures are "from the expedition with arctic ship toward the North Pole in the period June 24, 1893 to August 13, 1896, and are provided on the web by Nasjonalbiblioteket (The National Library of Norway). 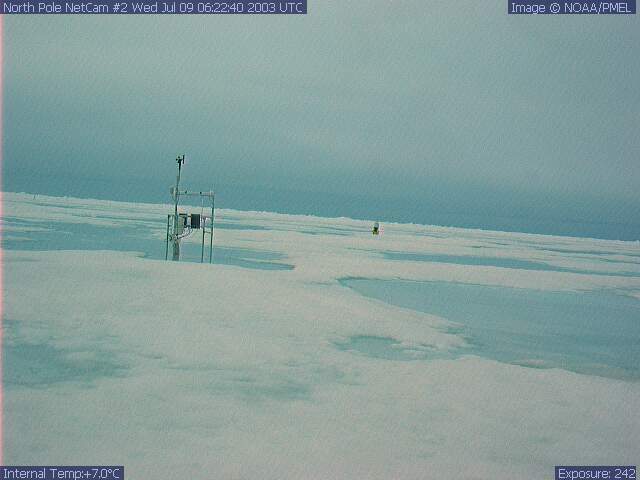 Why are there pools of water at the North Pole in summertime? The water is meltwater from the snow melting in Summer temperatures that are above freezing. 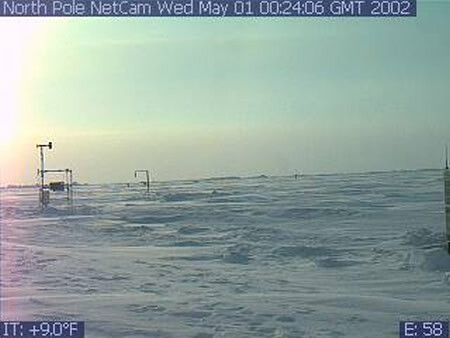 The pools of water are called melt ponds, and are observed at both web cam locations. On the Web Cam 2 photographs, notice that the leg of the stand appears to have grown thicker between July 4 and July 9, 2003. The new "thickness" is the battery canister, which contains lithium batteries, which are light. 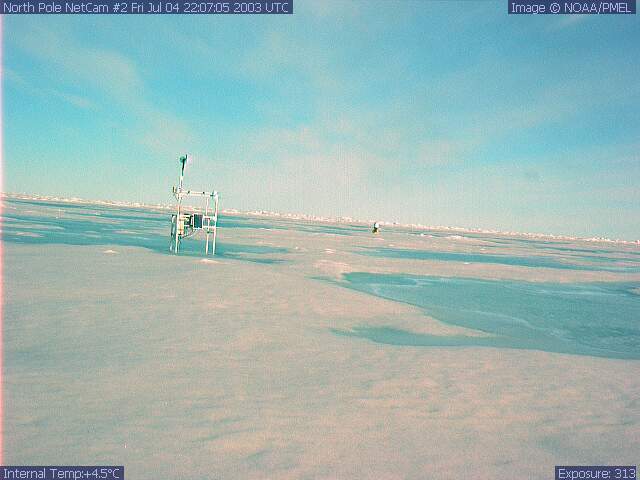 The hole that was drilled for the canister is probably flooded by the meltwater, and the canister is floating up. This is good, since it means that the water won't get into the canister or the electrical connector on the lid. However, we hope that the canister won't float much higher and fall over. Autumn signals the approach of winter cold and darkness. 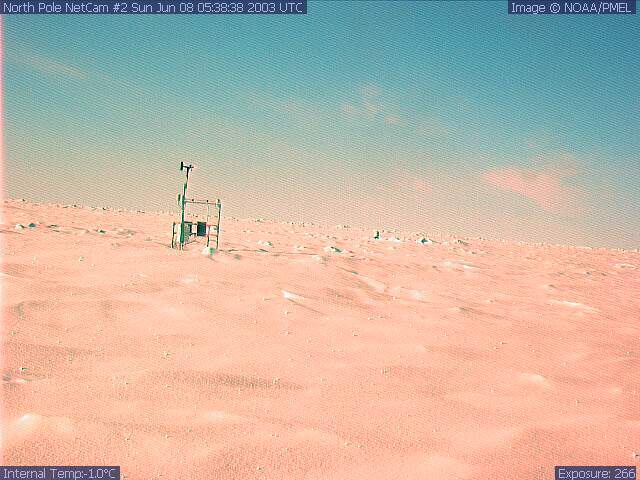 In these pictures, the melt ponds have frozen, and a recent snow blizzard has covered them with wind-blown snow. 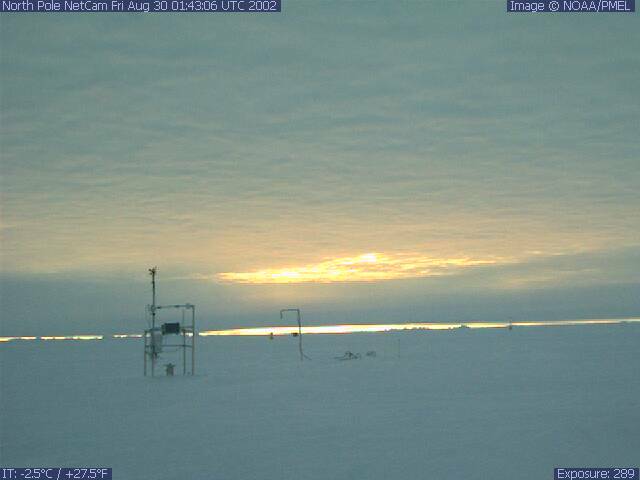 The sun is low in the sky as Winter cold and darkness falls over the North Pole. 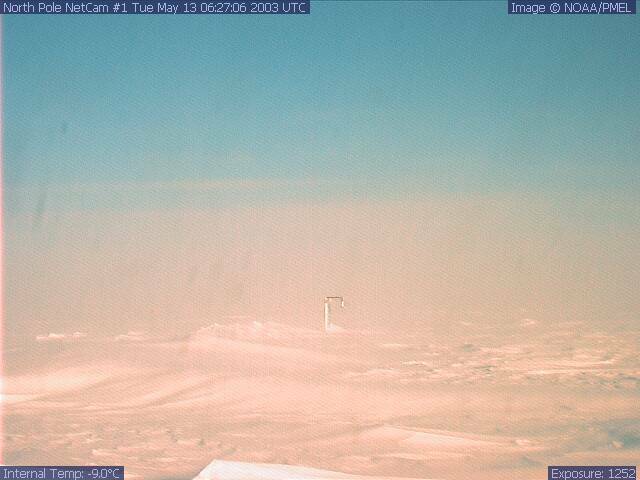 Snow falls, and blowing snow or ice covers the camera lens. There may still be a bit of possible sunlight left in the season, and the melting from that sunlight, or sublimination by dry winds, may serve to remove the snow from the camera lens, but with the onset of winter, the camera will eventually remain snow covered. 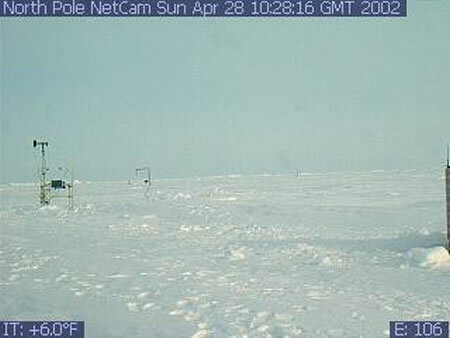 The North Pole is in winter darkness from October until March, and the North Pole web cam is re-deployed in April. 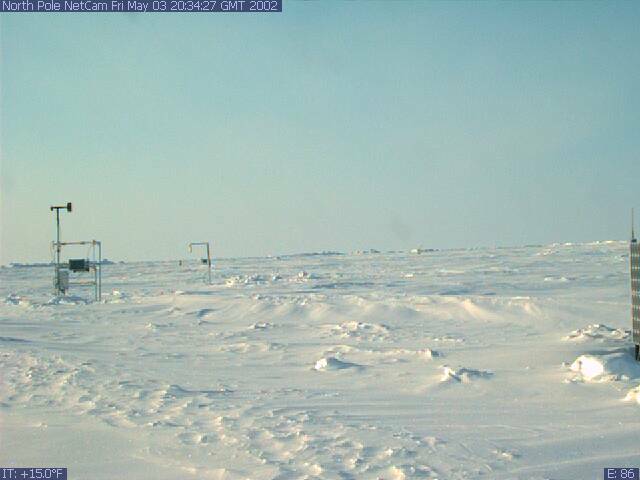 What are you seeing in the images from the North Pole?